Quality tool with a rugged frame and three (3) large flints. Long lasting round file and bright plated finish. Dependable ignition under all working conditions. Release slotted screw to rotate fresh flint into position. Newly redesigned and engineered to satisfy virtually any storage need. Top organizers enable small parts organization. Latch with geometric lock for smooth and easy use. New elegant design with sturdy robust appeal. Pad eye lock, enables to lock the toolbox. Top recesses for screws and washers. Tool tray with handle and enabled side access for flexible storage solutions. Made of heavy-duty canvas fabric. Plastic reinforced zipper. Wide bottom to sit upright. Size: 10 in. W x 3 in. D x 8 in. H.
Two lid organizers for small parts storage - accessible without opening the tool box; built-in pad lock eye for small locks - keeps contents secure; soft, wide rubber coated handle allows for easy and comfortable grip; tote tray inside to store smaller items. Durable clip hangs on toolbelts, belt loops etc. Carry and organize all miscellaneous parts, tools and accessories. 3 convenient sizes: 9" x 7", 7" x 6" and 6" x 5". Mesh windows. Assorted sizes and colors. Brown: 5.7 in. W x 4.8 in. H. Gray: 6.7 in. W. x 5.7 in. H. Black: 8.7 in. W x 6.7 in. H.
Tough ballistic nylon with wide mouth for easy access, padded sides and bottom. 6 outside pockets and 15 inside pockets; zipper closure. 8" wide x 13" long x 8-1/2" tall. Tools not included. 4 pockets on front, 3 pockets on back and 3 inner pockets. Size: 12" x 7". Newly redesigned and engineered to satisfy virtually any storage need. Top organizers enable small parts organization. Latch with geometric lock for smooth and easy use. New elegant design with sturdy robust appeal. Pad eye lock, enables to lock the toolbox. Top recesses for screws and washers. Tool tray with handle and enabled side access for flexible storage solutions. Two lid organizers for small parts storage - accessible without opening the tool box; built-in pad lock eye for small locks - keeps contents secure; soft, wide rubber coated handle allows for easy and comfortable grip; nickel metal-plated latches; tote tray inside to store smaller items. Made of heavy-duty Duckwear canvas to absorb tool oil. 11 assorted pockets. Fits 6 mm to 32 mm wrench sets. Opened: 18 in. W x 17.5 in. H. One hand operation latch allows opening when other hand is occupied; innovative design with robust structure and large volume; extra-wide soft grip handle for easy lifting; removable tray allows enough space for larger tools to be stored underneath; organizers on top lid for small parts organization. 12" standard Big Mouth? opens wide for easy access to bags contents. 8 multi-use pockets inside and 6 outside organize tools and accessories. Padded reinforced web carrying handles. 12"L x 8-1/2"W x 8"H. Made of single wall 600 poly ripstop fabric. Super-wide "Dr.'s Bag" opening. One-handed operation latch that allows for opening when the other hand is occupied; integrated water seal to help protect from water and dust; soft grip handle for easy grip and carrying; V groove on lid suitable for holding pipes and lumber while being worked on. Two lid organizers for small parts storage - accessible without opening the tool box; built-in pad lock eye for small locks - keeps contents secure; soft, wide rubber coated handle allows for easy and comfortable grip; nickel metal-plated latches; tote tray inside to store smaller items. 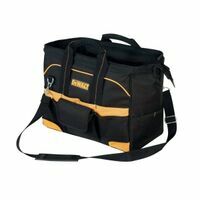 Professional contractor bag with 10 outer pockets, 12 inner pockets. Durable water resistant fabric with hard bottom. Cushioned web handles and shoulder strap. Stable gatemouth design with heavy duty zipper and wire reinforced rim. Excellent storage for a variety of tools. Dimensions: 17" L x 9-1/2" W x 12" H. Tools not included. One hand operation latch allows opening when other hand is occupied; innovative design with robust structure and large volume; extra-wide soft grip handle for easy lifting; removable tray allows enough space for larger tools to be stored underneath; organizers on top lid for small parts organization. Heavy-duty Duckwear canvas to absorb tool oil. 25 pockets; 17 loops. Carry handle. Quick release buckle to secure when rolled. Size when rolled: 4 in. D x 14.5 in L. Size when opened: 26 in. W x 14.5 in. H. Flexible platform allows different combinations; Bi-material handle on top of each unit for easy and comfortable lifting; all units can stack on top of the other, connected with durable side latches; heavy-duty metal latches for rust resistance. Upper and lower zippered insulated cooler compartments for organizing food and drinks; keep food and drinks cool on jobsite, at office, camping or any outdoor activity; large outside front pocket to organize tools, utensils and napkins; (2) smaller outside pockets to organize tools and accessories; lower compartment holds up to 8 beverage cans; adjustable shoulder strap makes carrying more comfortable; large padded web carrying handles. Poly ripstop/600D poly material. Super-wide in. Dr's bag opening. 16 pockets: 6 exterior, 10 interior. Padded ripstop bottom. Side pull handles. Mid-handle design for balance and control. Fan-cooled motor extends drill life. Lithium battery is integrated into the drill. Specs: 60 in-lbs torque, 550 rpm, and weighs 2.77 lbs. Includes charger and double ended bit. Top case with integrated carry handle for power tools and small parts; long metal carry handle for easy grip and carrying the tote; heavy-duty design and durable structure; front push-button for easy detaching/attaching of the case to the tote unit; heavy-duty, anti-rust metal latches on top case. Heavy-duty tool box metal walls with protective plastic base and edges; heavy duty metal latches; removable tote tray; integrated saw groove; removable vertical storage divider; easy grip handle; padlock eye provides secure locking. Flexible platform; removable dividers for customized organization of tools and parts; simple shape and proportions for easy access to both hand and power tools; removable, one-hand latches; enable easy connecting/detaching; lid organizer for small parts and accessories. Size: 6" H x 19" L x 12" W. One hand operation latch allows opening when other hand is occupied; innovative design with robust structure and large volume; extra-wide soft grip handle for easy lifting; removable tray allows enough space for larger tools to be stored underneath; organizers on top lid for small parts organization. 16" large Big Mouth? opens wide for easy access to bags contents. 12 multi-use pockets inside and 10 outside organize tools and accessories. Padded reinforced web carrying handles, adjustable shoulder straps. 16"L x 8-1/2"W x 10"H. Heavy-duty poly material cover with slip-resistant spine is durable and easy to carry; full zipper closure keeps loose articles secure; built-in calculator solar power keeps it ready for quick calculations; spring clip holds writing pad and notes in place; multiple pockets and sleeves for business cards, pens, and loose documents. Lightweight, durable, rust proof, plastic construction; telescopic aluminum handle; convenient and compact; folds down flat for storage; 80 lb loading capacity. The 12" pop-open design allows for easy access to tools and parts and is made of heavy-duty poly fabric; includes base pads to protect bottom and an adjustable shoulder strap. There are 9-interior pockets including one-zippered pocket for security, 20-exterior with one flap-covered pocket with hook and loop closure. 150 pound capacity hand truck folds down to 2" thick for easy storage; sturdy steel frame with an extra load support plate; integrated single hand lock and release handle with strong composite supports for a wobble free performance; bungee cord included, hand truck is equipped bungee knobs and pre-drilled bungee support holes. Dimensions: 40" H x 15.25" W, 5" wheels. Great for laundry, groceries, sport, school and much more; folds flat to 3" thick; push button telescopic handle; 4 wheel operation; stores any where; smooth rolling; 55 lb capacity; handle extends to 39.5". 3/8" keyless chuck; 16 torque/clutch settings. Variable speed; 0-550 rpm reversible. Electric brake. LED work light. Includes Ni-Cad battery, charger, 13 piece drill/driver bit set and storage case. Tough material combination and embossed logo branding; tough resin combined with gray metal and long lasting branding; tall tool box with a vertical storage unit for organization and easy access; long metal hinge to carry the heavy loads; large metal latches, heavy-duty, strong, rustproof; portable tray for hand tools and small parts; holes ready for inserting a lock for security of your tools; V-groove on top lid for any onsite sawing and adjusting needs. Flexible platform allows different combinations; all units can stack on top of the other, connected with durable slide latches; removable covered cups for organization of small parts and accessories; removable dividers for organization of drills and bits; ball bearing slides reliable for heavy-duty loads; bi-material handle on top of each unit for easy and comfortable lifting; heavy-duty metal latches for rust resistance. Tough material combination and embossed logo branding; tough resin combined with gray metal and long lasting branding; tall tool box with a vertical storage unit for organization and easy access; long metal hinge to carry the heavy loads; large metal latches, heavy-duty, strong, rustproof; portable tray for hand tools and small parts; holes ready for inserting a lock for security of your tools; V-groove on top lid for any onsite sawing and adjusting needs. Double wall 600 poly ripstop fabric. Super-wide "Dr.'s Bag" opening. Removable padded shoulder strap. Extra heavy-duty, professional; water seal makes toolbox water resistant; ideal for carrying power tools, hand tools and medium to large items; portable half tray allows room for storage or larger items; V-groove with ruler on top of lid holds materials such as lumber and pipes in place for cutting. 10 Pockets inside and 13 pockets outside to organize tools and accessories. 10" x 3" Multi-compartment plastic tray to organize small parts, recessed on top for easy access. Reinforced web carrying handles and adjustable shoulder strap. Overall dimensions: 16"L x 8"W x 11"H. For drilling and screwdriving through wood, metal and plastic. LED work light illuminates the surface for drilling in dark places. Soft grip handle provides added comfort during use. Specs: 11 position clutch, 100 in-lbs torque, 0-600 rpm and weighs 3.5 lbs. Includes 12 volt lithium ion battery, charger and double-ended bit. Innovative design with robust structure and large volume; telescopic handle for convenient maneuverability and folds down for storage; removable tray allows enough space for larger tools to be stored underneath. Flexible platform allows different combinations; all units can stack on top of the other, connected with durable slide latches; removable covered cups for organization of small parts and accessories; removable dividers for organization of drills and bits; ball bearing slides reliable for heavy-duty loads; bi-material handle on top of each unit for easy and comfortable lifting; heavy-duty metal latches for rust resistance. Durable tool box with integrated organizer for small parts and connectors; extra wide carrying handle makes it easy to transport the box around the jobsite; heavy duty resin design stands up to the toughest daily abuse; top organizer detaches from tool box for added versatility; corrosion resistant latches keep your valuable tools safe and secure in the box; perfect storage solution for mechanics, electricians, maintenance workers, etc. Compact, lightweight and powerful 250 in-lbs of torque. 0-350, 0-1300 rpm speed ranges, reversible. Built-in LED work light. 3/8" single-sleeve keyless chuck. Includes Lithium-Ion battery, charger and double-ended screwdriver bit. Features 15+1 application settings, on-tool bit storage and soft grip handle. Specs: 0-700 rpm no load speed and with battery weighs 4.5 lbs. Includes battery, double ended bit, charger & carrying bag. Reinforced interior bottom panel and heavy duty stitching and bar tacking at stress points. 18" 'MegaMouth' opens wide for easy access. 12 multi-use pockets inside and 13 outside organize tools and accessories. Internal metal frame holds bag open, large interior to carry power tools, circular saws and hard hats. Padded handles and adjustable shoulder strap. 18"L x 11"W x 12"H. Push button telescopic and lightweight aluminum design; smooth rolling 2 wheel design; stores anywhere - even cramped spaces for the ultimate storage convenience; ergonomic grip and fold away handle; 155 lb load capacity. Lithium drill/driver with 18 plus 1 clutch settings. 0-700 rpm; 110 in lbs of torque. Weighs only 2.1 lbs. Includes 3-5 hour charger and (1) 12 volt Lithium battery. Also includes a built in LED work light that is activated by the drill trigger. The 3/8" keyless chuck allows for easy bit changes. Durable 4mm thick structural foam box wall gives robust structure to the stand alone units; integrated water seal in every unit for protection of contents and long life for your equipment; metal carrier with adjustable foldable brackets allows tailored configuration; central locking mechanism secures the box to the frame; IP65 rating - water and dust resistant. Specifically designed to be durable enough to withstand tough jobsite conditions. The cooler utilizes double insulation and a food-grade leak proof liner to keep ice cold for 24 hours without leaking. Additionally, Milwaukee constructed the cooler with 1680D ballistic material base and heavy duty metal zippers for a longer life. A tape measure clip with a bottle opener provides ultimate versatility. Lastly, Milwaukee implemented a tech pocket and dry storage compartment to make this cooler a versatile jobsite storage solution. For use with the dewalt "TSTAK" system; 4 heavy duty wheels; for transporting tools and stored items around the worksite. Durable 4mm thick structural foam box wall gives robust structure to the stand alone units; integrated water seal in every unit for protection of contents and long life for your equipment; metal carrier with adjustable foldable brackets allows tailored configuration; central locking mechanism secures the box to the frame; IP65 rating - water and dust resistant. Built-in LED light can be easily directed at work area or into tool bag to help identify tools and parts; 3 levels of light output allow adjustment for wide area illumination or close-up work; 11 multi-use pockets inside and 18 outside to help you better organize your tools; padded web carrying handles and adjustable shoulder strap; base pad feet to help reduce wear and abrasion; powered by (2) AAA batteries, included. 1680 heavy-duty poly fabric. Molded, waterproof bottom. Removable padded shoulder strap. StayPut? handle grips. Bag has a 14" open-top design with collapsible bar handle and is made of heavy duty poly fabric with base pads to protect bottom. Includes 16 exterior pockets, 10 interior pockets with 2 flap-covered pockets and one large zippered pocket for security, adjustable, non-slip padded shoulder strap and padded bar handle. 1680 heavy-duty poly fabric. Open tote with diamond PVC reinforced bottom. Includes plastic small parts tray. Removable padded shoulder strap. Cordless drill with matrix quick connect drill attachment. Compact and lightweight design allows you to carry out drilling/driving tasks in confined spaces with ease. Lithium Ion battery holds a charge for up to 18 months. 20 volts; 0-800 rpm; 10 clutch settings and 3/8'' chuck size. Drill includes double sided bit tip, 20v max power unit, drill/driver attachment, 20v max battery and charger. 14 pockets inside and 23 pockets outside to organize tools and accessories; 13-1/2" x 3" multi-compartment plastic tray to organize small parts on top for easy access; padded web carrying handles and adjustable shoulder strap; abrasion resistant rubber feet; large zippered outside pocket and heavy-duty tape clip. 18"L x 11"W x 11"H. Use for drilling and screwdriving through wood, metal and plastic. LED work light illuminates the surface for easier drilling in dark places. Compact and lightweight. Specs: 115 in-lbs torque, 650 rpm, 11 clutch settings and weighs 4.25 lbs. Includes: drill/driver, 20V max lithium ion charger, 20V max lithium ion battery, 2" double ended bit tip and storage bag. The 16" large open-mouth bag has 14 interior pockets, small parts bin, padded shoulder strap and reflective material; has reinforced water-resistant bottom. Durable 4mm thick structural foam box wall gives robust structure to the stand alone units; integrated water seal in every unit for protection of contents and long life for your equipment; metal carrier with adjustable foldable brackets allows tailored configuration; central locking mechanism secures the box to the frame; IP65 rating - water and dust resistant. Use your DeWalt 20V MAX Lithium ion battery and our internal custom design battery dock as a USB charging source. Battery not included. USB charging battery dock simultaneously charge 2 devices via USB ports; 3 internal charging wall pockets fit tablet, phone and/or camera; low battery cut-off protection monitors battery voltage to avoid battery charge over-depletion; 20 multi-use pockets and 3 outside help organize a wide variety of hand tools. Constructed with impact resistant polymers and metal reinforced corners to provide up to 100lbs of weight capacity and ultimate durability in harsh jobsite conditions. Featuring an IP65 rated weather seal to keep out rain and jobsite debris and a metal reinforced top handle. The Milwaukee PACKOUT? tool box is fully compatible with all Milwaukee PACKOUT? modular storage products. Specs: 200 in lbs of torque, 2 speed gear box that allows for high torque or high speed applications, 0-350 rpm/0-1,250 rpm, 16 position clutch, LED light, battery charge indicator and weighs 2.8 lbs. Includes a 18V lithium battery and 3 to 5 hour charger. Free Batteries For Life. The 18" pop-open design allows for easy access to tools and parts and is made of heavy duty poly fabric, includes base pads to protect bottom and an adjustable shoulder strap. There are 26 exterior pockets including 2 flap-covered pockets, 14 interior pockets including one zippered pocket to secure valuables, utility knife pocket, measuring tape clip, easy double pull and heavy duty zipper. High performance motor delivers 283 units watts out, with a 2 speed gear box (0-350/0-1500 rpms). 1/2" keyless chuck for fast and easy bit changes. LED light brightens dark work areas. Compact (8.25" long) and lightweight (3.5 lbs). Includes: (1) Drill/Driver, (1) 1.3 aH battery and (1) charger. Constructed with impact resistant polymers and metal reinforced corners to provide up to 100lbs of weight capacity and ultimate durability in harsh jobsite conditions. Featuring an IP65 rated weather seal to keep out rain and jobsite debris and a metal reinforced top handle. The Milwaukee PACKOUT? tool box is fully compatible with all Milwaukee PACKOUT? modular storage products. Drive more screws flush the first try with the Lithium cordless drill that powers through wood, metal and plastic. AutoSense technology means you'll have less stripped screws, less work surface damage and ideal accuracy. Eliminates the guesswork with a cutting-edge electronic clutch that automatically stops when a screw is in place. An LED light illuminates work surfaces for easier drilling in dark places. Compact and versatile. Lithium Ion battery is always ready, holds a charge up to 18 months. Active depth control for precise adjustments. 0-800 rpm. Includes: (1) 20 volt max Drill/Driver, (1) 20 volt Max Lithium-Ion battery, (1) charger and (1) double ended bit. 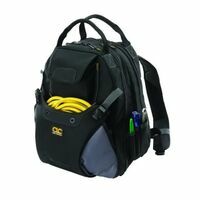 Features 35 pockets for organizing tools; impact resistant molded base protects and allows backpack to stand up; 1680 ballistic material; load-bearing harness - padded and breathable for all day comfort; laptop sleeve holds laptops up to 15.6"; bulk pocket - quick access to bulks items such as fish tapes and power tools; attachment strap - allows bag to be easily and securely attached to vertical handles. Variable speed trigger controls users drilling speed. 2-speed gear box for high speed drilling and high torque applications. Matches driving power to specific applications and prevents screw stripping. Batteries included delivers double the run time. Specs: 0-400/0-1,250 no load rpm, 25+1 clutch settings, on-tool bit storage and weighs 4.5 lbs with battery. Includes two batteries, charger, double-ended bit and carrying case. Collapses to 8" wide for easy storage; securely locks open and closed; 3 levels for holding items; handles feature dual comfort material and 3" swivel wheels with a sleek modern design; constructed of durable, lightweight aluminum with 3" rubber swivel wheels; max load 50 lbs per level; open dimensions: 34" x 15" x 26-1/8"; closed dimensions: 42" x 15" x 8". Do not stand on or ride on; keep hands clear when folding shut; follow maximum weight instructions and do not overload. Worx 20 volt lithium batteries fit a wide range of Worx cordless lawn and workshop tools. MaxLithium battery provides maximum run time and holds its charge up to 18 months. Variable 2-speed design covers a wide range of drilling and fastening applications. Extremely compact and lightweight for fatigue-free work. 3/8" keyless chuck for fast bit changes. 15 plus 1 position clutch allows precise torque management. 265 in-lbs of torque makes quick work of tough drilling and driving jobs around the house or workshop. LED light with low battery indicator. No load speed: 0-350/0-1350/min. Rubber over mold grip for improved comfort and control. Weighs only 2.8 lbs. Includes: Cordless drill and driver, (2) 20 volt MaxLithium batteries and a 20 volt MaxLithium charger. Powered by Lithium-Ion battery for fade-free power and lighter weight (2.2 lbs) which helps reduce fatigue during extended or elevated use. 300 in/lbs of torque to handle tough jobs in tight spaces. Two-speed gear setting to match the appropriate speed to the application. 21 plus 1 clutch with 21 torch settings and a drill mode for ultimate precision and control. Optimized handle dimensions for a secure grip and ergonomic comfort in all hand sizes. LED light effectively illuminates dark work spaces. Free-standing design allows drill to stand on its own when not in use. Charger circuitry prevents overheating and power loss. Balanced tool weight ensures proper wrist alignment. 3/8" keyless chuck for simple bit replacements and a variety of applications. No load speed 0-350/1,300 rpm. Responsive variable speed trigger for complete control during operation. Kit includes (2) 12 volt peak Lithium-Ion batteries, (1) 12 volt peak 25 minute quick charger, (1) No. 2 Phillips Driver bit, (1) 7 piece bit set and (1) carrying case. 1680 heavy-duty poly fabric. Tech compartment in back fits up to 13 in. laptop. Tablet compartment in front. Dual handles allow handling as a work station. Adjustable sling strap works on either shoulder. For Vulcan 48" and 36" job boxes (SKU 770.9892). Includes "brake" function. High performance motor delivers 330 unit watts out. 2 speed gear box (0-400/0-1,600) delivers the power needed to complete large or small applications. Metal ratcheting chuck minimizes bits slipping in chuck. Battery gauge displays charge remaining in the battery. LED light brightens dark work areas. 20 volt max Lithium Ion batteries with 1.5 amp/hour cells delivers more power and run time in a smaller package. Compact size (7-3/4" length) and light weight (3.5 lbs) allows tool to work in tight areas and minimizes user fatigue. Compact, lightweight, two speed transmission for optimal speed and torque control. LED light provides visibility in dark areas. Specs: 180UWO max power, 0-400/0-1500 rpm no load speed, 25 nm max torque, max. drilling capacity [wood] 19 mm, max. drilling capacity [metal] 10 mm, spindle thread and weighs 2.2lbs. Includes two 12V max lithium ion battery packs, fast charger, belt hook and contractor bag. Designed for ultimate durability, protection and storage. The backpack has the most durable hard molded base on the market with up to 5x better durability than the competition. Constructed of 1680D Ballistic Material and with rugged metal zippers, the backpack provides unmatched durability. With 48 total pockets including 2 hard-shell pockets that are designed to protect electronics and equipment from impact, the backpack provides exceptional organization. The padded and breathable load-bearing harness evenly distributes the weight for unsurpassed comfort and jobsite performance with up to 2x more padding than competitive units. Brushless motor delivers more run time. Compact (7.2" front to back), lightweight design fits into tight areas. High speed transmission delivers 2 speed settings (0-600/0-2,000 rpm) improving speed and torque control across a range fastening and drilling applications. Ergonomic comfort grip handle provides ideal balance and tool control. Metal 1/2" ratcheting chuck for superior bit gripping strength. LED light with 20 second trigger release delay to increase visibility in dark or confined spaces, LED placement on tool foot eliminates chuck shadows. Battery and charger not included. Part of the PACKOUT? Modular Storage System; constructed with impact resistant polymers; 250lgbs. weight capacity; industrial grade extension handle; 9" all-terrain wheels; IP65 rated weather seal; metal reinforced corners; metal reinforced locking point; interior organizer tray; mounting location for the ONE-KEY? TICK?. Powered by Lithium-Ion battery for less weight (3.7 lbs) and fade-free power. Powerful 400 in/lbs of torque to handle tough jobs in tight spaces. Two speed gear setting to match the appropriate speed to the application. 22 plus 1 stage clutch delivers 22 torque settings and a drill model for ultimate precision and control. LED light effectively illuminates dark work spaces. 1/2" keyless ratcheting chuck for quick and simple bit replacements. Responsive variable speed trigger provides complete control during operation. No load speed 0-450/1,250 rpm. Kit includes: (2) 18 volt Lithium-Ion batteries, (1) 18 volt 35 minute charger, (1) double-sided Phillips bit and (1) carrying case. Combines a large volume storage tool box with durable 7 in. wheels. With rust-resistant metal latches, bi-material top handle and side latches that allow stacking all other TSTAK units on top, this is a great maneuverability solution. High performance motor delivers 330 unit watts out. Metal ratcheting chuck minimizes bits slipping in chuck. 2 speed gear box (0-400/0-1,600) delivers the power needed to complete large and small applications. Battery gauge displays charge remaining in the battery. LED light brightens dark work areas. 20 volt Max Lithium Ion batteries with 1.5 amp/hour cells delivers more power and runtime in a smaller package. Compact size (7-3/4" length) and lightweight (3.5 lbs) allows tool to work in tight areas and minimizes user fatigue. USB charging battery dock simultaneously charges 2 devices via USB ports. Maximum 2 amps shared output. 3 internal charging wall pockets can hold a tablet, phone and/or camera and can charge 2 devices through a USB connection to a 20V MAX Lithium battery pack. Low battery cut-off protection monitors battery voltage to avoid battery over-depletion. Integrated 2-level LED light system allows adjustment for wide area illumination or close-up work. Multiple interior panels hold a multitude of tools and accessories like drills, extension cords, pliers, screwdrivers, wrench sets, drill bits, testers and much more. 31 multi-use pockets inside and 2 outside help organize a wide variety of hand tools. Padded web carrying handles and adjustable shoulder straps make carrying more comfortable and convenient. Large pads on back for extra comfort makes carrying heavier loads more comfortable on stress areas of the back. Easy double-pull, heavy-duty zipper. Base pad feet helps reduce wear and abrasion. Maximum initial battery voltage (measured without a workload) is 20 volts. Nominal voltage is 18. Built-in organization compartments, convenient lift out carry tray. Made of 1680 denier poly material. Signature "Dead On" skull molded front pocket. Durable molded handle. Multiple front anchors for clip on carabiners. Main tool compartment: 19 pockets / holds drill / drill bit organizer. Front tool compartment: 7 pockets holds up to 8 in. screwdrivers. Rear tech compartment: 3 pockets / holds 17 in. laptop / tablet / files. Breathable straps with moisture-wicking lining on back to manage perspiration. Small front pocket & side cargo pockets. Cell phone holder fits up to iPhone? 6 Plus. Holds up to 50 lbs. Overall size: 20 in. x 17 in. x 10 in. 2 speed gear box (0-350, 0-1500 rpm) covers a wide range of drilling and driving applications. High output motor delivers 480 in. - lbs. of max torque. 1/2" keyless metal locking chuck provides improved durability and bit retention. 24 position clutch reduces stripping of fasteners by properly adjusting the torque setting. Integral LED work light provides greater visibility to work area. Includes: (1) BTC400 18 volt Lithium Drill/Driver, (2) BTC480L Lithium Ion batteries, (1) BTC492L 18 volt Lithium Ion charger, (1) PH #2 Screw Driving bit and (1) Bit tip storage. Designed with a high performance motor that delivers 300 unit watts out (UWO) of power for completing a wide range of applications. Compact, lightweight design fits into tight spaces. High speed transmission delivers 2 speeds (0-450 and 1,500 rpm) for a range of fastening and drilling applications. 1/2" single sleeve ratcheting chuck provides tight bit gripping strength. Ergonomic handle delivers comfort and control. Kit includes: 2 Lithium-Ion batteries, battery charger and convenient bag to carry tool. Built-in organization compartments, convenient lift out carry tray. Ergonomic comfort grip handle provides ideal balance and tool control. Compact (7.52" front to back), lightweight design fits into tight areas. LED light with 20 second trigger release delay provides increased visibility in dark or confined spaces. Weighs only 2.6 lbs. Also included with the Compact Drill/Driver: (2) Li-Ion batteries, (1) charger and (1) kit bag. Built with a Milwaukee 4-pole frameless motor, the M18 compact 1/2" drill driver delivers 500 in-lbs of torque and up to 1,800 rpm. At only 7-1/4" length, and weighing only 2.9 lbs, this drill driver allows you to access tight work spaces. All metal gear case and 1/2" metal chuck provides maximum durability, even on the most challenging work sites. RedLink intelligence provides advanced protection in abusive situations and manages the tool's temperature to provide maximum life. The RedLithium battery pack delivers more work per charge and more work over pack life. The kit includes (1) M18 Compact 1/2" drill driver (Bare Tool), (2) M18 Compact RedLithium batteries, (1) M18 and M12 Multi-voltage charger (1) measuring tape, (1) 42 piece accessory kit, (1) Milwaukee INZALL marker and (1) carrying case. Features 6" All-Terrain metal rim wheels; industry's strongest extendable handle; all metal skid plates; full length metal axle; 200 lbs weight capacity; wide grip handle; fold down front panel; 1680D ballistic material construction; integrated tablet sleeve; 66 total pockets. Features Powerstate brushless motor which delivers up to 350 in-lbs of peak torque with maximum sustained torque to complete a variety of applications. Redlithium battery technology for superior pack construction, electronics and performance deliver more work per charge and more over pack life. Redlink plus intelligence for optimized performance and overload protection using total system communication between tool, battery and charger. 30 minutes total charge time. Chuck type: 1/2" metal single sleeve - ratcheting lock. Speed: 0-450/0-1,700 rpm. Lightweight and versatile. Kit includes: (1) M12 Fuel 1/2" drill/driver, (1) M12 Redlithium 2.0 compact battery pack, (1) M12 Redlithium XC 4.0 extended capacity battery pack, (1) belt clip and (1) carrying case. Sub-Compact Brushless Cordless Impact Driver Drill is a drilling and driving solution with significantly less weight and is part of a class of compact tools, with the size and weight of lower voltage tools but with the performance, power and compatibility of 18 volt. Efficient brushless motor with two speed settings and dual L.E.D. lights illuminate the work area. Innovative Assist Mode (A-mode) helps eliminate "screw cam-out" and "cross threading" by driving at low speed until tightening begins, and is ideal for driving longer fasteners. Ergonomically designed handle with rubberized soft grip provides increased comfort. Ideal for working in tight spaces. Specs: 0-500/0-1,700 RPM, 0-1,600/0-3,900 IPM, 350 in. lbs. maximum torque, 6-3/8" length, and 2.8 lbs. weight. The Kit Includes: 18 volt 1/2" Sub Compact Brushless Driver Drill, 18 volt Lithium-Ion battery, 18 volt charger, and 14" Contractor Tool bag. Makita-built 4-pole motor delivers 480 in. lbs. of Max torque. 2 speed transmission (0-600 & 1,900 rpm) for a wide range of drilling and driving applications. Dual L.E.D. lights with afterglow illuminate the work area. Ergonomically designed handle with rubberized soft grip provides increased comfort. Compact design weighs only 3.3 lbs. with battery for reduced operator fatigue. 7-1/4" long. All metal gear construction for increased durability. Ratcheting chuck engineered to prevent bit slippage and improve bit retention. Kit includes: Drill driver, (2) 18V compact Lithium-Ion batteries, (1) rapid charger and a bag. Delivers a powerful performance, with 600 in-lbs of torque and two drilling speeds (0-1,700 rpm for high speed and 0-500 rpm for torque). This cordless drill was engineered with a heavy duty chuck that allows for increased robustness and torque transfer, as well as the Bosch Compact Tough design for the shortest head length in class (7.0" long) and a weight of only 3.5 lbs. This is a durable and beefy drill that can power through the toughest materials and has an LED for visibility in hard to see areas. This kit includes: (1) 18 volt Compact Tough 1/2" Drill/Driver, (2) 18 volt 2.0 Ah Lithium Ion SlimPack batteries, (1) 18 volt fast charger, (1) double sided Phillips Drive bit and (1) carrying bag. Compact, lightweight design fits into tight areas. High speed transmission delivers 2 speeds for a range of fastening and drilling applications. Ergonomic handle delivers comfort and control. Heavy-duty ratcheting chuck provides superior bit gripping strength. Specs: 20V Max, 350UWO max power, 2000 max rpm, 15 clutch settings and 0-600/0-2000 rpm. Includes two 20V max lithium ion battery packs, 30 minute fast charger, belt hook, on-board bit holder and kit box. Brushless motor delivers more run time. XR Li-ion batteries with fuel gauge provide more capacity over standard packs. Compact (7.2" front to back), lightweight (3.5 lb) design fits into tight areas. High speed transmission delivers 2-speed settings (0-550/0-2,000 rpm) improving speed and torque control across a range fastening and drilling applications. Ergonomic comfort grip handle provides ideal balance and tool control. Metal 1/2" ratcheting chuck for superior bit gripping strength. LED light with 20 second trigger release delay provides increased visibility in dark or confined spaces. LED placement on tool foot eliminates chuck shadows. Includes (1) 1/2" drill/driver, (2) 20V battery packs, (1) charger, (1) belt hook, and (1) kit box. Built with a Milwaukee 4-pole frameless motor, the M18 compact 1/2" drill driver delivers 500 in-lbs of torque and up to 1,800 rpm. At only 7-1/4" length, this drill driver allows you access to the tightest work spaces. Advanced overload protects the tool against abusive situations and provides maximum life. All metal gear case and 1/2" metal chuck provides maximum durability, even on the most challenging worksites. LED light. 30 minutes charge time. Kit comes with (1) M18 compact 1/2" drill driver, (2) M18 Red Lithium compact batteries, (1) M18 & M12 multi-voltage charger and a carrying case. Metal carrier with adjustable foldable brackets allows tailored configuration; central locking mechanism secures the boxes to the frame; "ToughSystem" cases not included. Weight capacity: Brackets - 176 lbs., Tote plate - 265 lbs., use on stairs - 175 lbs. ; Dimension: 26" L x 37" H x 9" W.
Brushless motor optimized for efficiency. Provides long run-time and longer tool life. Delivers 500 in-lbs of torque and 0-450/0-1,800 rpm for a wide range of drilling and fastening applications. Compact design provides ideal balance and control. Also ideal for overhead applications or work in tight spaces. All metal gear case and 1/2" metal chuck provide maximum impact and shock durability. RedLink intelligence provides advanced overload protection against abusive applications and monitors the temperature to prevent damage and ensure maximum tool and battery life. RedLithium battery for more work per charge. Weighs only 3.7 lbs with battery. On board fuel gauge on battery. 6-7/8" tool length. Kit includes: (1) M18 1/2" Compact brushless Drill/Driver, (2) M18 RedLithium 2.0 compact battery packs, (1) M18 and M12 Multi-voltage charger and (1) carrying case. Features hardtop construction, designed for stacking; 6" All-Terrain metal rim wheels; industry's strongest extendable handle; all metal skid plates; full length metal axle; 250 lbs of weight capacity; wide grip handle; fold down front panel and 1680D ballistic material construction. Pairing the tool with the Tool Connect app enables you to access the last seen location of the device and diagnostics. Brushless motor delivers up to 75 percent more runtime vs. 18V NiCad brushed motors. Dewalt Home mode and 3 programmable modes to customize speed and light brightness. Ergonomic comfort grip handle provides the ideal balance and comfort. Specs: 1/2" chuck, 0-2,000 RPM, 460 UWO max power, 4 speed settings, 3.4 lbs. tool weight. 15 clutch settings. Includes: DCD792 Tool Connect Compact Drill/Driver, (2) Lithium-Ion batteries, charger, and kit box. Max XR Premium Lithium Ion batteries offer longer tool run time and enhanced durability. 3 speed all-metal transmission matches the tool to task for fastest application speed and improved run time. Heavy-duty 1/2" metal ratcheting chuck with carbide inserts provides superior bit gripping strength. LED light with 20 second delay after trigger release. High power, high efficiency motor delivers 535 unit watts out of max power for superior performance in all drilling and fastening applications. Features extended run-time batteries, 3-speed all-metal transmission, heavy duty ratcheting chuck helps prevent bits from slipping and falling out and LED worklight. High power, high efficiency motor for superior performance in all drilling and fastening applications. Specs: 450UWO max power, 0-500/0-1,250/0-2,000 max rpm, 22 clutch settings and weighs 6.25lbs. Includes one hour charger, two 18V XRP batteries, 360 degree side handle and kit box. Easy lift extended edge lid. Tall, deep handle recesses. Bolt cutter free locking system protects padlocks inside 12 gauge steel housings from cutting tools and pry bars. Padlocks (not included) cannot be pried or pulled out. Heavy-duty hinge is staked and welded to prevent the hinge pin from being driven out to break in. Heavy-duty 1" steel locking arm holds the lid open. Easy access 3-3/8" tall caster bolsters for adding optional casters (not included). Easy lift extended edge lid. Tall, deep handle recesses. Bolt cutter free locking system protects padlocks inside 12 gauge steel housings from cutting tools and pry bars. Padlocks (not included) cannot be pried or pulled out. Heavy-duty hinge is staked and welded to prevent the hinge pin from being driven out to break in. Heavy-duty 1" steel locking arm holds the lid open. Easy access 3-3/8" tall caster bolsters for adding optional casters (not included). Easy lift extended edge lid. Tall, deep handle recesses. Bolt cutter free locking system protects padlocks inside 12 gauge steel housings from cutting tools and pry bars. Padlocks (not included) cannot be pried or pulled out. Heavy-duty hinge is staked and welded to prevent the hinge pin from being driven out to break in. Heavy-duty 1" steel locking arm holds the lid open. Easy access 3-3/8" tall caster bolsters for adding optional casters (not included). The 60 volt Max VSR Stud and Joist Drill with E-Clutch system features a 1/2" chuck and brushless motor that provides corded power in a cordless tool. Ideal for plumbers, electricians and HVAC installers who need to drill large diameter holes in wood. This drill provides exceptional power, control durability and runtime with its 60V brushless motor, E-Clutch system, mechanical clutch and 2 variable speed ranges. Equipped with the innovative bind-up control, this drill increases user control in bind-up/stall situations by sensing a stall during use and managing torque accordingly. Adjustable ball handle and 2 position side handle for leverage and control. Metal gear housing for jobsite durability and increased reliability.